Spiritual joy depends on the cross. Unless we deny ourselves, we will find ourselves in everything and that is misery. As soon as we begin to deny ourselves, out of love for God, we begin to find God, at least obscurely. Since God is our joy, our joy is proportioned to our self-denial, for the love of God. I say: our self-denial for the love of God, because there are people who deny themselves for the love of themselves. It is not complicated to live the spiritual life. But it is difficult. We are blind, and subject to a thousand illusions. We must expect to be making mistakes almost all the time. We must be content to fall repeatedly and to begin again to try and deny ourselves, for the love of God. It is when we are angry at our own mistakes that we tend most of all to deny ourselves for the love of ourselves. We want to shake off that hateful thing that has humbled us. In our rush to escape the humiliation of our own mistakes, we run head first into the opposite error, seeking comfort and compensation. And so we spend our lives running back and forth from on attachment to another. If that is all our self-denial amounts to, our mistakes will never help us. The thing to do when you have made a mistake is not to give up doing what you were doing and start something altogether new, but to start over again with the thing you began badly and try, for the love of God, to do it well. Makes you wonder what would happen if, at least to a small extent, people in this country would take Merton’s words to heart. A little less self-centeredness and narcissism, a little more self-denial. Talk about the kind of radical changes that would result. Friday: Fly from Phoenix to Atlanta, stay overnight at the Airport Westin in Atlanta. Sunday: …I’ll arrive around 9 PM for a 1-night stay at the International Hotel. By this time I fully expect to be in zombie mode. Monday: Up bright and early to meet a colleague and fly from Mumbai to Vadodara (formerly Baroda) in northwest India, where I’ll check in at the Taj Baroda and head straight for the office for a there sometime around noon. I’ll work out of the Baroda office until Wednesday PM, when, accompanied by some colleagues, I’ll be off by car, and then by plane, to Pune, where our other office location is. There I’ll stay at the Westin Pune for a 1-night stay. Thursday: I’ll work out of the Pune office doing some work and some interviews until mid-afternoon, when I’ll fly back to Mumbai, arriving late on Thursday night. Friday: My flight from Mumbai to Newark leaves at 1 AM, so I’ll be back in the States by mid-afternoon. From there (assuming, of course, that I’m not detained for observation at Bellevue), I’ll grab a flight to Phoenix and be back home early Friday night. So it promises to be quite the whirlwind trip. I’ve gotten my hepatitis shots, have started on my typhoid fever and malaria meds, have bought a sufficient number of Powerbars (I’m told their essential for India travel) to keep me going, and plan on doing it all via carry-on. No muss, no fuss, a couple of dress pants, a couple of casual pants for the travel, and my usual supply of Hawaiian shirts – perfect for the monsoon season there. Having the opportunity to meet my team in their culture, their home, ought to be pretty interesting, to say the least. And don’t worry, I’ll have my trusty laptop with me and will blog whenever I have a chance to and/or am not lathering foam out of the side of my mouth. Stay tuned! It seems we have struck paydirt on the fore-mentioned treasure hunt for autographs for my “The Endless Summer” movie poster. The initial seeds were sown with inquiries to Mike Hynson, one of the principal surfers from that movie, via his surfboard manufacturing website, and Walter Georis, guitarist for The Sandals, the surf band who provided much of the movie’s music, via his winery website. If you’d like to buy a book, our next signing is at the ASR show at the San Diego Convention Center on August 13-15. If that doesn’t work, you can go on our website at www.endlessdreamspublishing.com and order a book or if you want to call and take care of the transaction over the phone we can do that also. We’ll definitely be selling books at the ASR Show. And I’m sure Mike will sign your poster for you. See you there! So the weekend following my return from India (God willing, of course) it looks like we’ll be traveling to San Diego for the first – and hopefully not the last – stop on this so-called treasure hunt. If I don’t hear from Walter Georis by the time I’m back from India, looks like I’ll have to take a more direct route via the telephone. But that’s OK, it’s not supposed to be easy, right? After all, it is a treasure hunt, isn’t it? 1. The Obama administration through a ObamaCare provision starting in 2011 puts the screws to special-needs families. 3. Massachusetts Rep. Barney Frank, who has no problem forcing private banks and lending institutions to pony up their own money to underwrite loans to high-risk home buyers, raises a stink about not receiving his $1 senior discount on a ferry to a trendy Fire Island gay haunt. 4. The Democrat-controlled Senate pushing a so-called “DISCLOSE Act” that would allow greater union spending while suppressing the ability of grassroots organizations to contribute to election campaigns. The latest vote failed today, but with the unions (especially the purple people-eaters of the SEIU) so deep in the Dems pockets don’t expect this to die easily. Such is the true face of modern-day liberalism. Anyone who thinks today’s Democratic Party still stands for the have-nots in this society and are rightful heirs of the honorable tradition of the likes of Franklin and Eleanor Roosevelt, and JFK and RFK better set their internal clocks for a political wake-up call come this November. Because it’s coming, and it can’t come too soon. News item: TV and radio ratings fall for Red Sox. I can’t say that’s surprising, because even though I spent good money on my MLB Extra Innings DirecTV package a couple of months back I haven’t felt a whole lot of interest, let alone passion, for this year’s edition of the Boston Red Sox. Talk about a waste of money – I’ve only watched a handful of games from start to finish, many not at all. Y’know in show biz, it’s great if you’re really really good, even OK if you’re really really bad. The worst thing you can be is boring, and that’s what the 2010 edition of the Red Sox have been. Oh sure, there have been some nice human interest stories along the way in the replacement players the Sox have had to throw into the fray with the major injuries to Jacoby Ellsbury, Dustin Pedroia, Victor Martinez, Clay Buchholz, Josh Beckett, Jason Varitek, and Jeremy Hermida, and the day-to-day ailments of Mike Cameron and J.D. Drew, but let’s be honest: people don’t want to watch the likes of Kevin Cash, Darnell McDonald and Daniel Nava. Worse, in a town that’s gotten pretty cozy with winning, these guys ain’t gonna bring you to the Promised Land. In a division with the Yankees and the Rays, not even close. But there’s something else going on that maybe people don’t want to admit: sure, the Sox have had a damned good run with two World Series championships in 2004 and 2007, but now the cast of characters that brought those championships has gotten a little stale to interest people on a day-to-day basis. Think about it: David “Big Papi” Ortiz, while putting up decent enough numbers, is still a shadow of his former self. Pitcher Josh Beckett may be in the same category. Terry Francona has been a great manager – perhaps the best ever to have ever been at the Sox helm – but haven’t we seen his full act after seven years? The grand old core of Pedro Martinez, Curt Schilling, Varitek, Ramirez, Jonathan Papelbon, Hidecki Okajima, Drew, and Ortiz belong to the ages. It’s time for new management – and new blood – to surround the core of Pedroia, Buchholz, Kevin Youkilis, and Daniel Bard, especially with up-and-comers like outfielders Josh Reddick and Ryan Kalish, and shortstop Jose Iglesias just a year or two year away from bringing youthful enthusiasm and a sense of real excitement and passion back to the old ballyard. Until then, watching the 2010 Sox is akin to watching the Rolling Stones or the Eagles play out the string. They was great times, to be sure, and they can still put on a hell of a show on occasion. But it’s time to move on. All one has to do is contrast the play of the Rays and Yankees to realize the 2010 Red Sox are done like dinner. Right now, they’re not pitching well or defending well. And don’t even get me started on shortstop Marco Scutaro or Daisuke Matsuzaka. I can’t watch either of them. I’m not jumping off the bandwagon; heck, I was never on it. I just find it hard to watch a caliber of baseball that simply doesn’t match up in excitement or intrigue to what I’ve – we’ve – been used to seeing. Obviously, I’m not alone in that assessment. Time to start thinking New England Patriots football. The last stage of our “suburban renewal” project for 2010 is just a few weeks away – that is, replacing the dull brown paint in the livingroom and hallways we’ve always detested with some soothing pastels to make all our recent floor work really stand out. Currently we have this huge ratty-looking rug we got on a trip to Mexico years ago hanging in a big area of the hallway that we’ve been wanting to take down for awhile (you know us Arizonans and all things Mexican, right? 🙂 ); the question was, what to replace it with? And then my friend John from the Huntington Beach International Surfing Museum (HBISM for all of you insiders!) 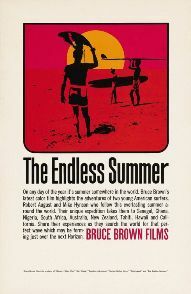 found me exactly what I was looking for – a 2′ X 3′ poster of Bruce Brown’s iconic surfing opus “The Endless Summer” (see above in virgin form) signed by none other than Bruce and one of the two surfers featured in it, Robert August). Figuring such a poster matted and framed would not just brighten up the hallway but say something about one the house’s owners (though I’m not sure what), I called up John and ordered myself one. But it got me to thinking: why only Bruce Brown and Robert August? What about Mike Hynson, Robert’s companion in the move? So I asked John, and he tells me Mike typically doesn’t sign stuff like that without a nominal fee, and that others who have bought the same poster hunted down Mike (who is still well known in the surfing industry and has a new book out about his life) to have him sign. John told me that since I’m only a six-hour drive away from L.A. it would be worth it, especially since Mike apparently has a unique way of signing his name. Now I’m intrigued, and a light goes off deep in my cranium. Keep in mind that The Great White Shank is a minimalist by nature and a collector of virtually nothing except for books on Catholic theology and surf tunes for my MP3 player, so I’ve never really identified with all those folks I’ve seen at sporting events and golf tournaments who hang around to harass every athlete they can find to get autographs they can subsequently sell for profit – the autograph-hunting business being what it is. But that’s the farthest thing from my thoughts. I’m just looking for a dynamic, statement-making conversation piece for a newly-painted hallway. So, I’m thinking, why not? I’ll do the drive to L.A. and bring my poster with me. And, were I to be so fortunate as to get Mike Hynson’s autograph, why stop there? Why not see if I can get autographs from the three active members of The Sandals, the band who provided not only much of the music in the movie but its memorable, wistful theme song? That would mean trying to track down Walter Georis, who runs a winery in the Carmel area (the above video was filmed there), his brother Gaston, who appears to be affiliated with a restaurant in the area called Casanova, and their lead guitarist, John Blakeley (location and whereabouts unknown), whose most recent work with Ron Nagle, called “Tan Mantis”, is a gem. And why not embark on such a treasure hunt? After all, once I’m back from India the only thing I’ll have to look forward to the rest of this year starting in September is the removal of my prostate and hopefully recuperating and out of diapers in time to attend fellow Goodboy Steve “Killer” Kowalski’s wedding in December. It takes me all of a minute to rattle the idea around in my head and commit to it. The question is how to get started, and then, if I can plant some good seeds, put a plan into effect. So this is my quest, and one that at least ought to be interesting enough to blog about and keep myself and my readers interested. Updates coming as progress is made. Stay tuned. So there I was, at the Friday night pizza joint with Kevin, nursing a third Pinot Grigio, flirting with the cute Albanian bartender, and discussing the state of the world. Kevin has been a long-time regular visitor of this blog, but has always hesitated to comment – ‘specially since he and I are at opposite ends of the political spectrum. Not that he’s much of a Obama guy – he isn’t – but, tellingly, while he enthusiastically voted for Barack Obama in 2008 there’s no way (in his words) on God’s green earth he’d ever vote for him again. And this is from a guy heavily involved with unions and union contracts. What Kevin took exception to in our discussion – this occurring interspersed with my trying to convince the cute Albanian bartender that the Atomic Mosquitos (a new discovery!) were one helluva surf band – was the fact that I blog (and, in his view, hide) behind the pseudonym of The Great White Shank. His feeling being, if you don’t have the courage to use your real name when you opinionate about someone who has set out to destroy this country as those of my generation have come to know and love it, your opinions somehow lose their authenticity. I mentioned to Kevin that anyone who wants to click on the “All About The Great White Shank” link will discover I’m not hiding behind anything. I write what I feel, and I feel what I write. This is all about full disclosure. Bloggers like my good friends Rob and Dave E will tell you, it’s one thing to blog, it’s a whole ‘nuther thing to blog about things and topics interesting enough to make people want to check in on a regular basis. The challenge of blogging, more than anything, is to be interesting. I try on some occasions to be at least that. The Beach Boys’ Dennis Wilson once wrote, “if you want to know me, listen to my music“. As The Great White Shank, I say, if you want to know what is going on in my life, check out Goodboys Nation weblog. In the coming days and weeks you’ll learn about a certain treasure hunt I have embarked on, an India business trip rapidly approaching, and the treatment involving my prostate cancer. Sure, not all of my posts will be the most riveting, but no one will be able to question my integrity. Not that Kevin was – I just think that every now and then it’s a good thing to remind everyone that me and The Great White Shank are pretty close to one in the same – not exact copies, to be sure – but close enough to be at least kissin’ cousins. Speaking of Dennis Wilson, this is arguably Dennis’ greatest composition. Enjoy! Long work week. 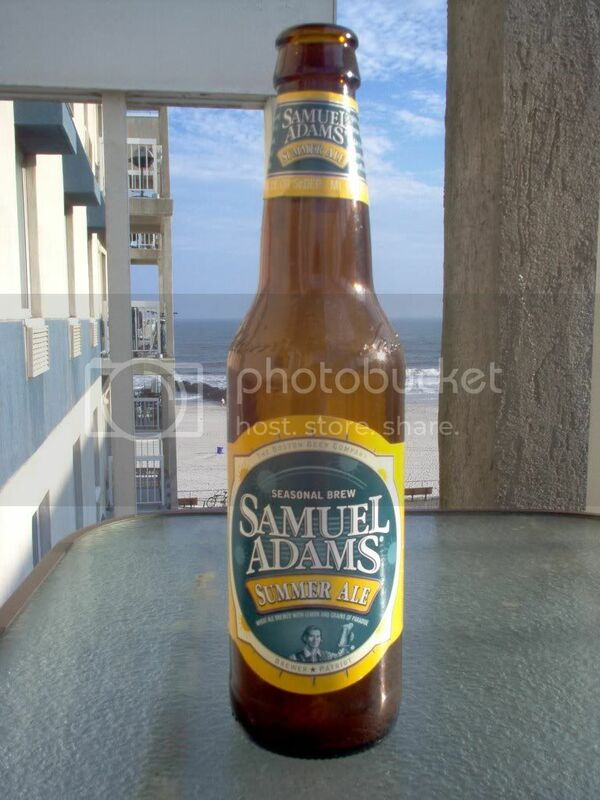 Hard to believe it was only a week ago were were down by the Portsmouth harborside, soaking up some suds and the social scene between our first and second Goodboys Invitational rounds. Next week will feature a whole heaping helping of preparation for my trip to India, so my goal this weekend is to try and take it easy, the only challenge being to get my gas grill working again without melting in the heat. 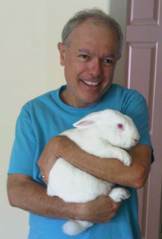 For those who love animals and would like to help in any way, our good friends at The Bunny Basics in Scottsdale are seeking donations for “Operation Backyard Bunnies”, a bunny rescue operation for over 100 rabbits rescued from some crazed-out rabbit hoarder’s backyard in Scottsdale a few weeks ago. There are a lot of different ways you can help – if your heart and/or wallet are willing please consider helping out. In honor of Goodboys champ Steve “Killer” Kowalski, here is his favorite song by my favorite surf band, The Sandals – “6-Pac”. I also like the spirit of this harder version by a great local SoCal band from Pacifica, The Wander-Ins” Enjoy! Who are these mugs, you ask? Why, it’s Steve “Killer” Kowalski and Pat “Doggy Duval” McLaughlin, 2010 Goodboys Invitational champs, who, 15 years after triumphing at Goodboys V at Killington (VT) G.C. once again lapped the field to take the coveted Spielberg Memorial Trophy, the symbol of absolute excellence for a Goodboys weekend. And what a weekend it was! 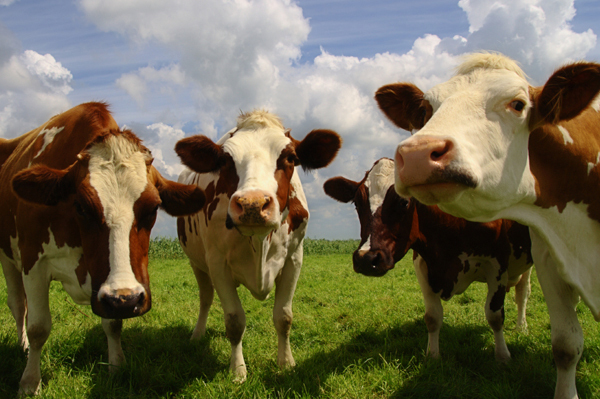 Not only did the ‘Boys play in the hottest conditions we’ll likely see in our lifetimes – thanks, Al Gore – but did so on courses ranging from “well, this is a wide open cow pasture” to “Holy #@$!, these greens are running faster than illegals out of Arizona!“. In between, it was plenty of Sam Summers, decent food at some Portsmouth eateries, plenty of sharing of Goodboys stories of lore, and a few surprises along the way. Friday began with a “grip it and rip it” round at Sagamore-Hampton G.C. – perfect for getting acquainted with your partner for the weekend and making those critical last-minute adjustments to your swing in anticipation of the challenges to come. The day was positively sweltering – as hot as weather I’ve ever played in – but there was a breeze now and then, and everyone rose to the challenge, shooting their number within a stroke or two. It didn’t count, but it helped served the purpose. 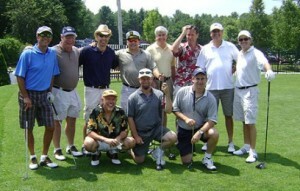 My favorite memory of the entire weekend was, after the rest of the Goodboys had headed down to Portsmouth to check in at our hotel, me, my partner Ron “Cubby” Myerow (above, front row right), and Killer (he in the cowboy hat above yours truly) sitting in the air-conditioned clubhouse, Sam Summers all around, renewing aquaintances and watching British Open highlights in beautiful HD. Me, I could have stayed there all weekend and just phoned my score in. Considering what I shot the next day, perhaps I should have. Thunderstorms came in that night, and we had a nice dinner at The Common Man before heading out on the town. At a harborside bar my partner tried his best to pick up a German tourist, but I think she was: a) married, and b) going for a run the following morning. [Ed. note: neither of which would have mattered much to me, but then again, I’m married and I don’t run.] We hooked up with Doggy Duval (who had spent his day in an air-conditioned office) and the Goodboys were officially gathered for the 20th year. Saturday dawned bright and hot, but the humidity switch had fortunately been turned off – damned good thing, because The Ledges G.C. in York, ME was plenty tough without Ma Nature making it an even more difficult setting than it already was. This course, as beautiful as it is, is muder for a high handicapper like me. The fairways are pretty tight, but it was the greens that made it really tough. It’s a testament to the skills of the other teams that only my partner and I put up a big number (and I do mean big) on such a difficult course. We were the only team truly out of it after Saturday, setting up for an unforgettable closing round on Sunday. Saturday night was, arguably, the highlight of the weekend. Wisely ensconsed in what was once the vault of a bank (bars and everything!) at Rira’s Irish pub, the Goodboys rolled out the official Songbook (Sammy Davis Jr.‘s “The Candy Man” was a highlight), flirted with waitresses, yakked it up, paid off humilation bets, and generally had quite the time for themselves. Humidity and temperature-wise, Sunday was the best day of the three for golf, and The Links at Outlook in South Berwick, ME didn’t disappoint. Wide open and British Open-esque on the front, tight and hilly on the back, it was a veritable “Run for the Roses” between the top three team, coming down to the last hole in perhaps the tightest finish in Goodboys history. When all was said and done, the team of Killer and Doggy Duval might have won the day, but a misplaced approach shot or a missed putt, and we could have had the first three-way sudden death playoff in Goodboys history. In the end, all bets were paid off, photos taken, and the obligatory jacket ceremony conducted with the usual pomp and flair. Another Goodboys weekend had been filed away into the record books, and a new Exec-Comm ponders all the options and possibilities for Goodboys XXI. The lads, some tired, some hungover, some a little of both, all scattered to the four winds, glad to have been a part of it all, glad to have it over. And what of The Great White Shank’s quest? You know, that 30 balls a week regimen to achieve my goal of breaking 100 during a Goodboys Invitational round for the first time? Well, let’s just say that if it weren’t for my swing coach Ben “The Funny Guy” Andrusaitis identifying my “death move” I doubt I would have shot that 98 (!) on Sunday at The Links at Outlook. The 105 I had on Friday wasn’t bad, the 120 at The Ledges (a combination of poor shot-making and poor course management) was beyond abysmal. But Sunday’s combination of trusting my new swing move and executing superior course management made it all worthwhile. Thanks, TFG – I owe ya one. Congratulations to the champions (whose picture will soon adorn Goodboys Nation weblog), and a big thanks to all the Goodboys for making Goodboys 20 such a memorable weekend. Hail Goodboys! A dead jellyfish in pieces still stinging beachgoers in Rye, NH. My boat being landed upon by a jumping whale. Nineteen stitches from the bite of a black tip shark, and this young lad is ready to go back in the water. You’re not too old to be bitten by a shark at New Smyrna Beach. Or too young to be bitten by same at Wrightsville Beach. But that’s OK, nothing matches the kind of shark that charges $220 (labor and parts) to fix a directional indicator sensor for a 2003 Saturn L300 at your local Saturn dealer. Those repair people will rip you to shreds.